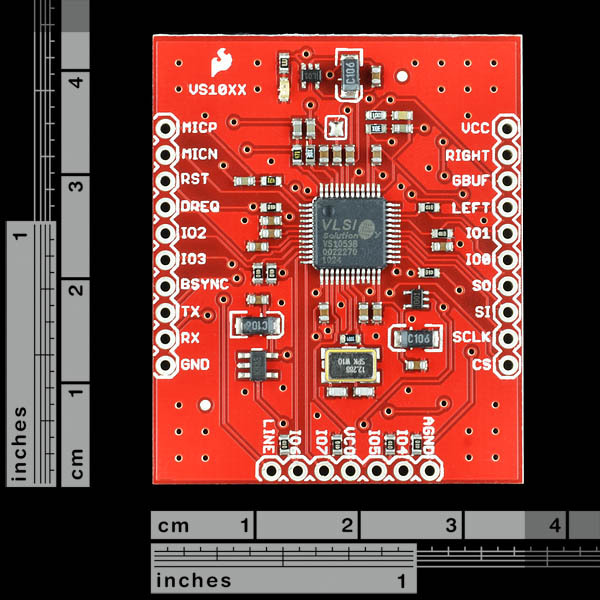 The VS1053 is a great MP3 decoder, and with this breakout board, it's easy to drop it into any project. The VS1053 is capable of decoding Ogg Vorbis/MP3/AAC/WMA/MIDI audio and encoding IMA ADPCM and user-loadable Ogg Vorbis. Can drive 30 ohm headphones with no additional power supply.. This new revision uses a new board layout and the TEST pin has also been tied in to IOVDD, no more green wires. So you power it with 5v and then send signals to it with 3.3v right? Just a comment if you ever redo this board -- maybe 2 comments. First, it seems like this board is large compared to the components on it, could it have a smaller footprint? Second, it would be nice to bring IOVDD out to a pin, so that we could tie the GPIO-n pins to the 3.3 volt supply. Okay, so I used your Eagle library for this board and discovered that the pins on the edge that are prtpendicular to the other pns are actually 0.4 inches from the other pins, while the library board layout is .035 inches away. Good thing I am not using any of those pins. You should update your Eagle library to match the actual board (if you haven't already fixed it. Which version of the library are you using? I'd like to check to see if this is fixed, but I'm not finding that board in the SFE library. Or were you referring to the actual board file itself in Eagle? My mistake ... I created this board for use on my project. I created it before I had the actual part in hand. So I will modify it. Think I may have blown the VR for AVDD because I did not connect it to input ground. Is that possible? Also, if I use a larger power for VCC, what is the rating on the power LED resistor? If I use 9 volts in, will that burn out the resistor? The resistor is a 330 Ohm. You may have blown a component out if you didn't have it hooked up completely, but without seeing your circuit, I can't say for sure. 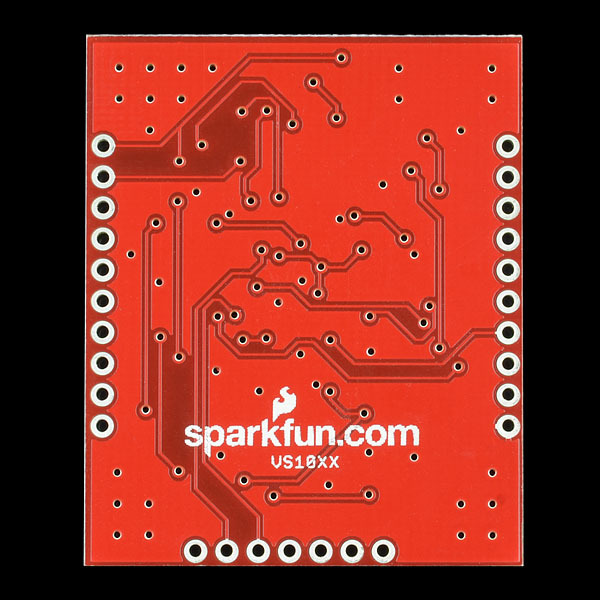 Send an email to techsupport@sparkfun.com and they'll be able to help you further. Any chance the VS1053 could be replaced with the SAM2195? The VS1053's midi sounds are pretty bad. The SAM2195's sound like professional synths. Does anybody know how to re-flash the board, an update has been published just recently Feb. 5th, 2013 and I'd like to get the update on this board, is this possible and how ? When you guys make another run of this board, can I suggest that you make this board slimmer so that it fits more easily on a standard breadboard? Everything is very luxuriously laid out with plenty of grazing space around each component, but it's a pain to run the jumper wires to the breakout board pins under the breakout board. Obscuring the wires also makes it hard to debug. A shorter board would also be nice, but narrower is more important. Thanks. Are you going to get these back in stock? Is it possible to record and play stereo-audio from line1/2 at the same time? Like "sending a RIFF header -> start ADPCM recording on line1/2 -> receive data -> transmit them back"? How to connect this board to arduino? Why nobody answer? You connect it the same way you would with a Musical Instrument Shield, the only difference is that you need to tie IO1 high to get it into MIDI mode. It's all in the MIDI Code Example file provided by sparkfun. Your best bet would be to email techsupport@sparkfun.com. 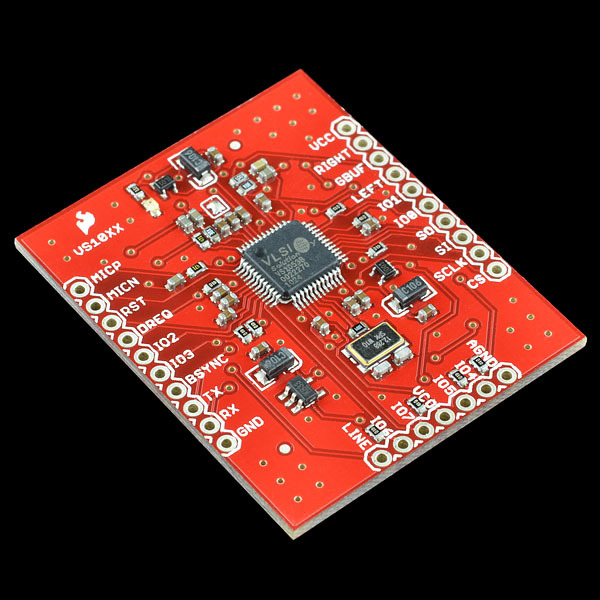 If you're looking to connect to an Arduino, try the MP3 player shield (DEV-10628) or the musical instrument shield (DEV-10587), both of which are designed for Arduino. Does this need voltage dividers (for data pins to an arduino) or is that taken care of onboard? I bought this to put in a custom MIDI footswitch I am designing. I have a similar board (Music Instrument Shield) which also has the VS1053 chip. Basically, for $30 or so; this is a full-featured Synth/Audio-Processor with all the core/glue components taken care of and with convenient 0.1" spacing pads. Very handy! I have tested it with some MIDI files that have 5 channels of data (Drums, Bass, Chording; Lead1 and Lead2) and it played them without a hitch. The instrument sounds and the effects are acceptable to me for my purposes. I have yet to evaluate the Audio Processing capabilities.